When was the last time you cleaned, edited, and organized your closet? What’s that you say? You can’t remember? Well, it’s high time you gave your wardrobe a makeover. Spring is an excellent time to clean out your closet. With the warm weather in the air, we're all in the mood for detoxing and clearing out the winter debris. It may seem intimidating at first, but trust me, a tidy closet can do wonders for your well-being. Not only will you get dressed faster, but you'll feel more in control of your busy life seeing an organized and accessible collection of clothing each day. 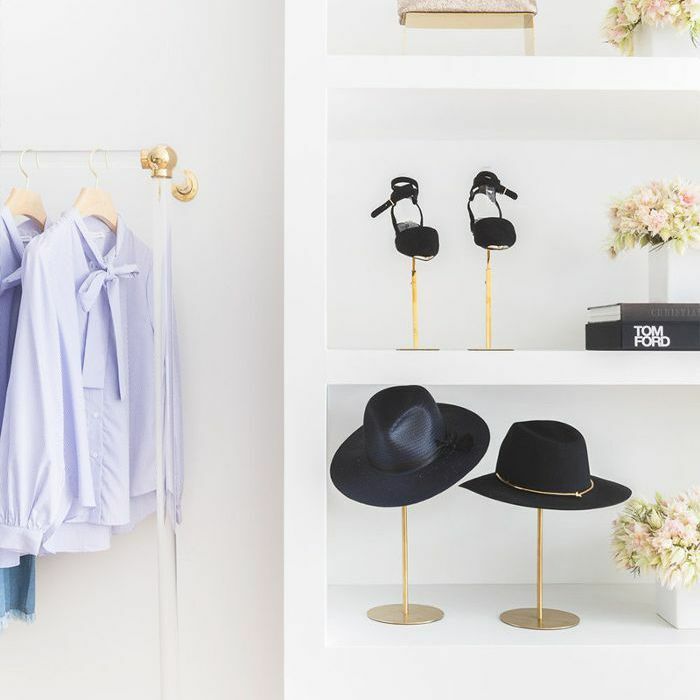 To inspire you to tackle that crowded mess once and for all, we tracked down the tricks that the pros—stylists who organize and edit clients’ closets for a living—use. Here are 11 must-know tips for the most pristine and perfect closet around. Start by going through your closet and sorting your clothing into piles. Pull everything out of the closet, working in sections. Begin with the hanging clothes, and once you’ve done those, move on to the pieces kept in a dresser. Items that you love and wear often go into the “keep” pile. Items you love but haven’t worn in awhile and you don’t know how they will fit go into the “try on” pile. Items you haven’t worn in forever go into the “purge” pile. Also, sort your clothing into winter clothes and summer clothes. During the fall, pack your summer clothes (caftans, bikinis, shorts, sundresses, etc.) away. In the spring, pack your winter clothes (tights, gloves, thick sweaters, thermals, etc.) away and keep them in a place that is not easily accessible. Rachel Zoe recommends you "store items you won’t touch until spring as far out of sight as possible." While every stylist has a different closet organization system, the one thing they all suggest is to organize clothing by category. “Skirts, pants, sweaters, blouses, jeans—organize all of the pieces by category,” Kinney says. According to Stacy London, host of TLC’s What Not to Wear, “It’s the oldest trick in the closet-cleaning book, but grouping by categories does make it way easier to know exactly what you have, and how much.” Rachel Zoe advises organizing by category and takes it one step further: “Arrange pieces by item, then style, length, and color, so that you can see everything clearly. Everyone has pieces they gravitate toward, and when you’re sorting clothes, pay attention to items that are repeat offenders. Get rid of duplicates you don’t wear. “Why would anyone have 12 white shirts in one wardrobe?!" wonders Stacy London. If your answer is to have a few extra backups, London has a response: "Why keep the backups if you’re always going to reach for the perfect one you love?" Keep the five black tops you love and wear often, but get rid of the other four that don’t spark joy and you have not worn. Get rid of anything you haven’t worn, pieces that don’t spark joy, and anything that is damaged, old, or stained. “If you haven’t worn something in over a year, it might be time to get rid of it, because it’s just wasting space,” San Francisco stylist Mary Gonsalves Kinney told me over the phone yesterday. Once you’ve got a large amount of clothing in the purge pile, sort through it. Make a “throw away” pile of items that are too old or damaged to be sold. Make a “to sell” pile of clothes that can be sold at a local consignment shop or on a website like Poshmark or the Real Real. “Recycle, recycle, recycle!” Zoe suggests donating or selling “pieces that no longer fit you or your style.” Finally, make an "archive" pile of clothing you have stopped wearing but want to keep for sentimental reasons, or because it has value. Many clothing pieces can be folded nicely and kept stacked neatly in the closet on shelves. Jeans, sweaters, fur, undergarments, and scarves are all items that Kinney says you should fold. “I fold underwear and slips, any undergarments, socks, and tights,” she explains. “Sweaters, especially cashmere, and fur collars should be put in a separate drawer. Be careful with fur. You can really ruin fur by smashing it into a closet.” Andrea Rapke, founder of The Organized Move, concurs: “Fold the very heavy sweaters so they don’t lose shape on the hanger. Separate your categories strategically. Don’t store your tennis shoes underneath designer evening gowns. Sooner or later, your gowns might start smelling like dirty feet! Place categories that you wear less, like party dresses, in an area of the closet that is harder to get to. Clothing that you wear the most, like everyday tops and dresses, should be the most accessible. Be sure to place all of your clothing on hangers that will keep them in place. You don't want all of your clothes falling off the hangers. When you get home from the dry cleaner, take the clean clothes out of the bags. “Never leave your dresses, or any other clothes, in the dry cleaning or plastic garment bags. The chemicals from dry cleaning attack the fibers of your clothing and cause damage,” Rapke says. Not sure how often you wear certain pieces? Perform the hanger test. Turn all the clothes hanging in your closet so that the hangers are facing the incorrect way, back-to-front. Every time you pull something out and wear it, when you put it back in the closet, place the hanger in correctly. After six months, you’ll be able to tell which clothes you have not worn. Get rid of these items! What is your technique for cleaning out, editing, and organizing your closet? Update: This story was originally published on January 12, 2016. Updated by Sacha Strebe.